Parents of teens have a lot to deal with these days. The last thing they need on their to-do list is a complete revamp of their meal planning and food purchasing norms. So if the teen in question comes home and announces “I’m vegetarian now,” or “I’m going to be a vegan” the parents first reaction is likely to be denial. What’s a parent to do? Arguing with a teenager about giving up meat is probably not going to change any minds. After all, teens can simply refuse to eat meat that’s served to them, which results in either wasted food or more arguing. A better solution is to find help and advice for dealing with the situation. I wrote “Feed Your Vegetarian Teen” to provide that help. I’ve met plenty of parents in this exact situation. Few of them reacted well to the idea of feeding a vegetarian. One parent sent her daughter to the kitchen every evening to make a peanut butter and jelly sandwich for dinner. One teen was simply left to his own devices, and ended up living on cheese pizza. Another teen was told to write a detailed report about all the nutritional consequences of giving up meat, as well as create a plan for preparing food that filled in any deficiencies. There are lots more stories like that, and in most cases the switch to a vegetarian or vegan diet led unnecessarily to conflict and confusion. The actual number of strict vegetarians and vegans is small – about 5% and 1% of the population – but meatless meals are becoming more common even among meat eaters. The health benefits of a plant-centric diet are well documented, and more health organizations are recommending that people switch to Mediterranean or DASH-style diets to reduce weight and risk for chronic diseases. But teens have unique nutritional requirements compared to adults. They’re growing and active and need proportionately more protein, calcium and other vitamins and minerals. Giving up meat (and dairy for vegans) limits the food sources for key nutrients. Protein intake is usually at the top of the list of concerns for parents of meatless teens. Traditional meals based on large portions of meat as an entrée can easily fulfill protein requirements. But if a teen gives up meat, where does the protein come from? “Feed Your Vegetarian Teen” includes a discussion of protein requirements, protein quality and plant sources of protein. The recipes are set up to allow family members to add their own preferred high protein foods to one main dish, so parents don’t have to prepare 2 or more different meals for dinner. Using protein foods – whether meat or fish or cheese or tofu – as a condiment rather than as the main focus of a meal is a key part of a Mediterranean style diet. It’s a good solution for parents of vegetarian teens, but it’s also a good strategy for anyone who wants to switch to a healthier diet. If you’re eating less meat, you’ll have to fill in with more plant-based foods like vegetables, grains, beans and nuts. In that respect, this book can help anyone who wants to take advantage of the health benefits of those foods. Actually “Feed Your Vegetarian Teen” could just as easily have been named “Feed Your Vegetarian Spouse” or “… Roommate” or “… Grandmother”. Lots of people are cutting back on meat. The book focuses on teens because they’re especially likely to find meatless diets compelling for all the reasons mentioned above. Even though those may be good reasons, teens are not likely to have the resources to follow through on the nuts and bolts of giving up meat while still eating healthy. Nutrition considerations, food purchasing and meal preparation are all pieces of the puzzle, and parents have the responsibility to make sure all the pieces of that puzzle fall into place. This book can help them do that. 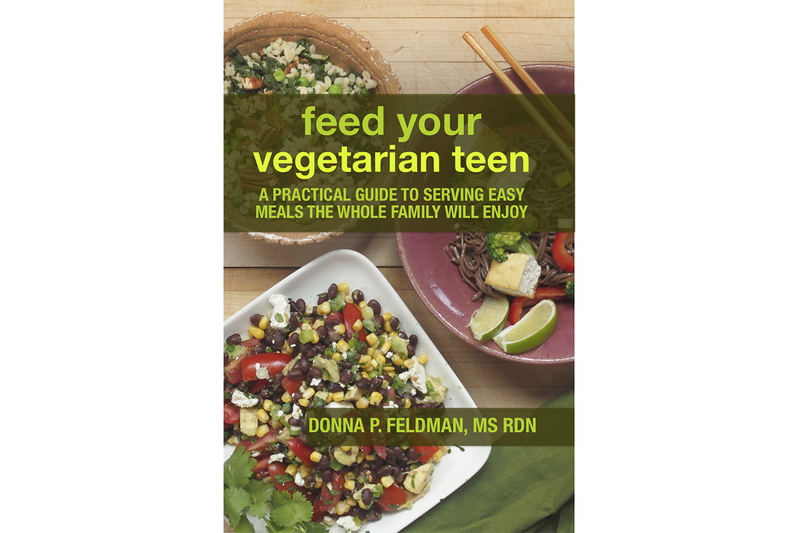 Feed Your Vegetarian Teen is available on Amazon in paperback or Kindle format. Co-host: Walk Talk Nutrition podcast. Blueberries: More than just a super grizzly bear food!